Well hello friends! How are you all? I've missed you! Things are certainly picking up on the wedding end of things, so I've been a busy little bee! The bridesmaids dresses came in today and they are gorgeous! I absolutely love them! Our stationery came from the printer so I've been writing thank you notes like mad now that we finally have our custom ones. I promise to give you all a little peek once I manage to have a photo shoot with everything. I'd like to present...our living room! 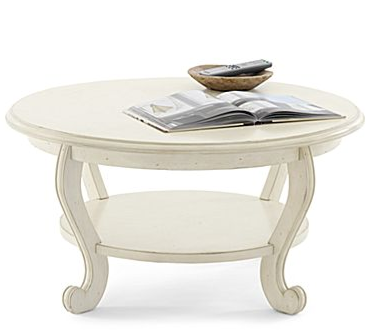 If you remember, that is the actual coffee table that was such an awful search then awesome score. It looks great next to a white slip covered couch. 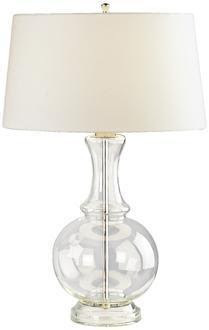 I just adore this pewter pharmacy lamp from Target! Perfection! The photo wall is via Melanie from Pretties and Posies, and I want to do one that's very similar. The bus roll art is from Bed Bath and Beyond and was a gift from Matt's family this Christmas. I can't wait to hang them in our new house! The armoire is an interesting piece...we don't own it but I've been checking Craigslist for an armoire to hide the TV that I could paint. However, this baby (with all my various coupons) is on sale for $160 at JC Penney. That's less than I paid for the coffee table! 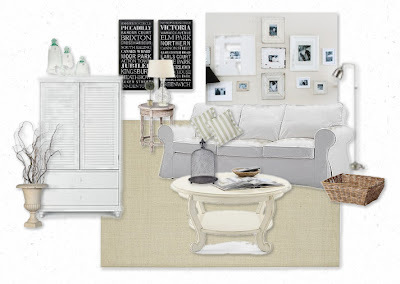 I won't be buying any more furniture right now, but I do have my eye on her! And she looks just lovely in our living room, huh?? The urn and curly willow are what we're using as some of the decor at the wedding, so I'm sure I'll have bunches of it stashed here and there throughout the house. I like the visual interest it adds. I think that's all! What do you think? Pretty comfy and inviting, huh? Have you gotten addicted to Olio Boards yet? I'm linking to Tuesday's Treasures at My Uncommon Slice of Suburbia and White Wednesdays at Faded Charm. Love it! 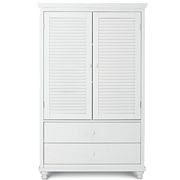 I found an amazing Pottery Barn armoire on Craigslist for $125. I love it and it is perfect. It did take a lot of stalking Craigslist, but it was worth it. Can't wait to see wedding stuff. You are so cute/funny and obsessed with Olio!! Love this and love you. Excited for next weekend catch-up and wedding crafts!! Oh your room looks fab. I've heard lot's of people mention Olio but I'm afraid to go there because I know I'll be HOOKED for sure!! Your living room is going to be so pretty! I am visiting from Faded Charm's White Wednesday.